The marriage between the Renaissance genius and Leonardo 98, the latest creation by the Azimut yard is certainly no coincidence; with a production on this level both technology and experience play a part that is just as important as synthesis between artistic creativity and architectonic innovation, with the whole focussing on pleasure. The pleasure not only of travelling at thirty knots in a luxurious world where noise is muffled and far off, but also the pleasure of admiring her sporty lines, streamlined to the point of being aggressive and being able to enjoy elegant solutions for all organisation onboard: character, performance and sunny open space on a wonderful daycruiser multiplied three times over! In short, a work of art, one that the Great Leonardo would have been proud of, a good five hundred years on. A lot of work has been done, architectonically speaking, to create a perspective capable of enhancing the already considerable space available; the revolving smoky glass dividing wall, which closes off the saloon astern, giving shape to an unusual circular area, where a round glass table is crowned by the original Philippe Starck chairs: this is the sinuous and natural continuation, dedicated to the dining area, of the softly rounded lines of the wardroom, where, in the shaded light of the wooden Venetian blinds, the eye travels from the spacious sofas to the stools at the bar, towards the bow, up to the natural horizon: the plasma screen and beyond that, the well-lit pilot station. With the glass dividing wall open onto the cockpit itself - electrically controlled obviously - the whole area becomes a spectacular 12 square metres; everywhere there is the sober elegance of sanded oak, cream coloured carpet, striking, essential combinations of steel and glass with red leather. The main control area, which can be completely isolated from the lounge area, is a mixture of refinement and functionality; this imposing machine can be controlled using the best of technology, both mechanical and electronic, set into precious wood and leather, with a sunroof that can be opened to admire the sky, if the horizon should not suffice. 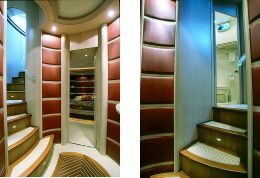 In the cockpit, next to the settee, two handy staircases lead down to the aft bridge where, as well as the garage for the jet-skis and storage space for the telescopic gangway, there is also a large door giving access to the engine room and the crew's quarters. Towards the stern, under the sundeck, four electric sliding panels open up to reveal storage space for the tender, in this case, a Bombardier over 5 metres long. 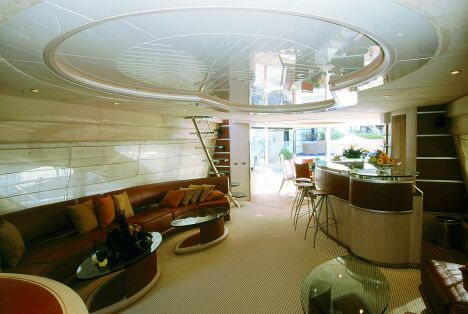 A single staircase leads to the flybridge: a waterfall of glass integrated into the décor of the living area, placed to starboard opposite the bar. 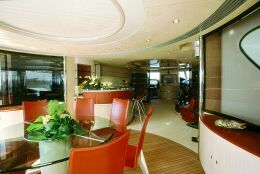 On the upper deck, an expanse of white dedicated to sun worshipping, behind the piloting station, a semicircular sofa can seat eight around the oval table; next to it a mini kitchen and towards the bow, 10 square metres of cushioned area around the Jacuzzi. The sleeping area is on the lower deck, with access from the wheelhouse; on the landing halfway down the stairs there is a handy "service" bathroom, then beyond the passageway widened by clever use of mirrors, the whole width of the beam is given up to the owner's suite. Here too we find the same refined elegance without frills; desk, sofa, wardrobe and a large polychrome marble bathroom lit by the light from no less than eight vertical portholes. On the left, towards the bow, a twin room and the VIP stateroom, only slightly smaller than the owner's suite. 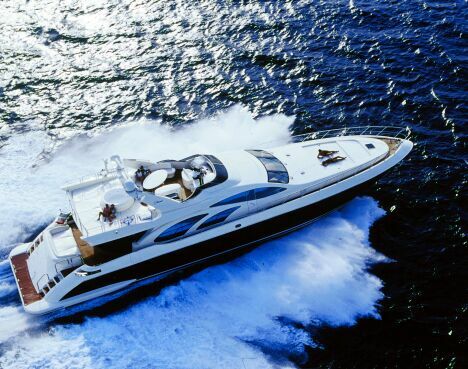 Privacy on board is sacred, but not only for guests and owners, as a visit to the crew's quarters confirms: separate entrances, from the lounge and from astern, private bathrooms and a crew mess next to the galley. The latter is rational and well designed, professionally equipped as far as concerns fridges, ovens, freezers and hobs, with a service lift resolving the problem of taking food up to the dining room on the upper deck. 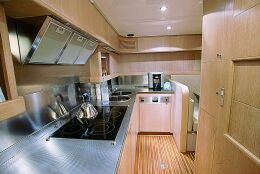 From the lower area there is access also to the laundry room and engine room, the yacht's true pulsing heart. Here the two MTU dominate, 2000 HP each, which power a system that also decides on problems of trim, relative to the speed and the state of the sea, using a system called Intruder; great care has been given to safety and soundproofing of this room, thanks also to the adoption of special insulated silencers, by the American Centek. The excellent performance does not obviously depend exclusively on the power installed: the new gliding bottom designed by Azimut and careful design of the propellers, weights and centre of gravity play an important part in the clean way the Leonardo ploughs through the waves. After the first model, presented at the Festival de la Plaisance in Cannes last September, other Leonardo 98s are in production for the year 2003, including a version with four cabins, ready to be admired (and envied) by owners, aesthetics and sailors throughout the glossy world of superyachts. Azimut: via M. L. King, 9-11; 10051 Avigliana (TO) - Italy; phone +39 011 93161; fax +39 011 9367270; website www.azimutyachts.net.